Business Plan Projections for Excel is a range of powerful, easy-to-use template packages for preparing comprehensive financial projections for business plans and budgets, strategic and corporate planning, business restructuring, financial appraisals and performance monitoring. Based on a user's assumptions, Excel Business Plan Projections generate fully-integrated five-year projections (profit/loss, cash flow statements, balance sheets and ratio analyzes). Incorporates extensive formulas and programmed menus and buttons so only very basic knowledge of Excel is required to prepare highly professional and presentable projections. Incorporates comprehensive facilities and features for advanced financial modeling users, while also being accessible to those minimal previous experience of financial or business planning. Offers lots of help and support including help menus, separate manuals, and online tutorials. 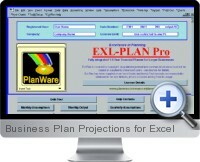 Excel Business Plan Projections include a copy of a 36 page business plan guide and template for use with Word. Choose between the US/Canadian and UK/International versions.